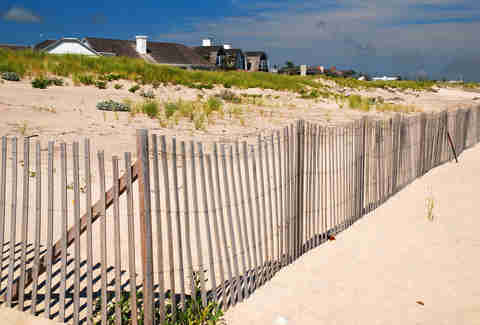 At the East End of Long Island, a long strip of beaches stretches all the way to The End -- a playground every Manhattanite knows collectively as “the Hamptons,” whether you ever get invited there or not. These beaches are where you’ll spot the financiers and celebrities who own one of the $5 million homes along the shore. They’re where you go strut your designer swimsuit, knowing the designer might actually be just down the sand. Outside of the quintessentially Hamptonian beaches, you’ll find others that offer an escape from the bougie trappings and just let you enjoy the sun and surf. No matter where you fit (or don’t) in the Hamptons scene, there’s a place in the sand for you out on Long Island’s South Fork. You just need to find it. In order of convenience, these are the best beaches the Hamptons has to offer. This secluded beach off Meadow Lane was voted one of America’s most beautiful in 2017 thanks to its white quartz sand, hulking dunes, and views of the sort of old-money mansions you read about in The Great Gatsby. The wide beach along the South Shore with its own livestream is one of the few that never feels overcrowded. (It’s also the only beach in Southampton with a lifeguard on duty.) There’s room enough, even, to set up the Kan Jam and get a game going without upsetting sunbathers. This prime beach real estate, popular with families, doesn’t come cheap. There’s a $40 parking fee, but that can be bypassed if you skip the lot and park on Halsey Neck Lane, right across from the beach. Otherwise, most side streets in the area prohibit parking, so consider taking the Long Island Rail Road two-and-a-half hours from Penn Station to the Southampton stop, a 10-minute cab ride from the beach. Another alternative is the Hampton Jitney, a shuttle bus that makes multiple stops throughout Manhattan and Brooklyn. It’s pricier than the LIRR, but runs more frequently. You can rent umbrellas and chairs at the beach, where you’ll also find showers and a serviceable concession stand. For an overnight stay, The Southampton Inn is charming and relatively affordable, just a mile away from the beach, pet-friendly, and offers shuffleboard, croquet, and ping-pong. App-based shuttle service Hampton Hopper will take you all the way to The End for free. The main beach in East Hampton is very, very nice, but for a less tony experience, hit Two Mile Hollow. 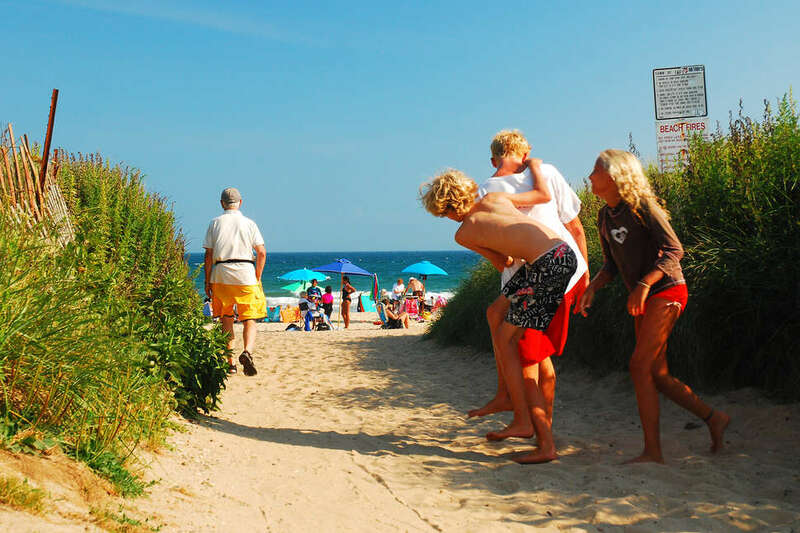 Once known as the Hamptons’ unofficial gay beach, the beach now draws a more diverse -- yet still young and hip -- crowd, blessedly light on actual kiddos. The $30 parking is capped at just 40 vehicles. The area around the centrally located East Hampton Village train station has a Cape Cod feel worth exploring. Visit Guild Hall, a performing arts center, for exhibits, movies, and concerts. Check out the historic library, founded in 1897 and stocked with a rare collection of artifacts that track the village’s history. 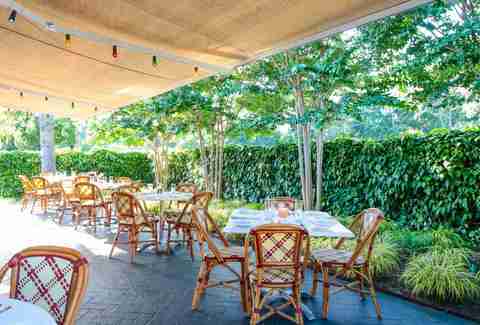 Or splurge at the trendy Nick & Toni’s, where you might catch celeb regulars like Alec Baldwin, Jimmy Fallon, or Ina Garten -- Barefoot Contessa herself -- chowing down on Italian-Mediterranean fare. For an eclectic eatery with vegan options check out Babette’s, which is named after the 1987 Danish film, Babette’s Feast, a movie in which a woman’s food brings a newfound sensuality to a quiet village. Martha Stewart is a big fan. The beach with nowhere to hide, so you may as well go to be seen. Usually packed with a younger crowd that may be nursing hangovers (luckily, the concession stand sells Gatorade), it’s the perfect mix for when you’re so over the crowds at Jones Beach, but still want the rowdy ambiance. Come to people-watch, or just to find parking ($25 per vehicle). The Amagansett train station, a 20-minute walk from the beach, is less than three hours from Penn. To see more of the area, rent a bike at Amagansett Beach & Bicycle Company and pedal your way to the home/studio of Jackson Pollock and Lee Krasner. Later, grab Mexican street food at La Fondita or order fried chicken at Brent’s General Store, a charming takeout spot with picnic tables outside. Head a little further out and stop by The Lobster Roll for the classic roll with mayonnaise or hot with butter. The Stephen Talkhouse, a beloved venue, hosts open mics, dance parties, and movie nights. You may see local celeb Jimmy Buffett, wasting away in a place that ain’t Margaritaville. This barrier beach is off the beaten path, situated down a long road straddling the east end of Fire Island and the west end of Westhampton Island. 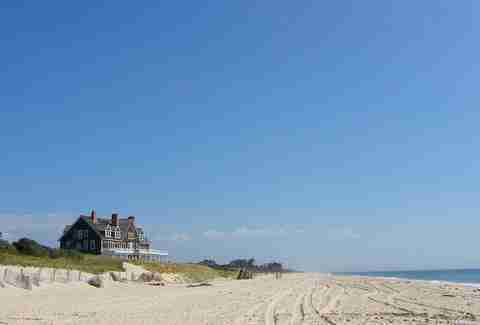 It’s a solid 15-minute drive from Westhampton’s Main Street down Dune Road past some of the most opulent homes in the Hamptons. The seclusion draws older, chiller beachgoers. 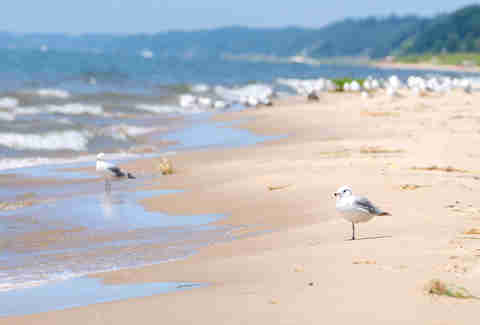 Sand bars make swims easy, seal sightings aren’t out of the question, and the water is known for its saltwater bass (the county issues night fishing permits). This is an escape beach relatively close to the city -- about two hours by car or by train to Speonk station. You’ll want to arrive before 10am to guarantee a parking spot in peak season. You may want to show up even earlier to catch a tangerine-tinged sunrise. After 5:30pm beach admission is free and you can check out the equally impressive sunset and live music on the boardwalk. Cupsogue feels every inch of its miles away from the city. Pack a picnic or grab a snack at the pavillion, where you’ll also find showers and changing rooms. Kirk Park is foodie heaven for the beach-set. Grab a giant iced coffee and a breakfast wrap at Joni’s Kitchen, chow down on the catch-of-the-day fish tacos at La Brisa, and enjoy the pan-seared scallops with pepper-hazelnut romesco at South Edison. Before clambering back on the train, get a lobster roll at Duryea’s Lobster Deck and grab one last beer at Montauk Brewing Company or cocktail at Navy Beach while you watch the sun go down. After a full day of swimming and eating, you’ll be ready to nap through your three-hour train ride back to the city, dreaming about your return. The park boasts fishing, biking, and scenic hiking trails where you’ll walk alongside parabolic sand mounds formed a century ago. You’ll spot a cranberry bog and the Phantom Forest, an area of ghostly branches that poke out from the sand on the self-guided nature trail that loops back to the beach. Bird watchers can check out the park’s Napeague Bird Conservation Area. With so much to see it’s worth making this a multi-day getaway. There are affordable hotels nearby, or you could pitch a tent. 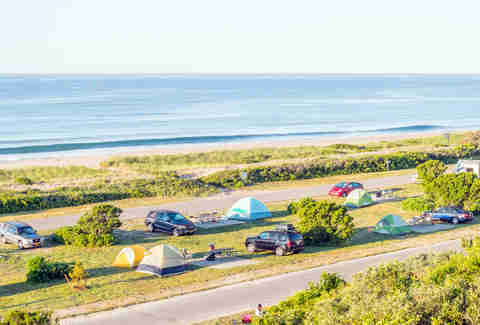 The park’s 190-site campground sports beach views for $35 a night for New York State residents. Camping permits can sell out nine months in advance, so plan ahead. The stargazing is worth a little extra effort. 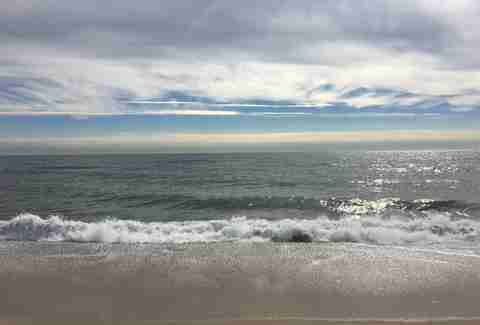 This is The End -- the tip of the South Fork where you’ll find the best waves for surfing. Whether you’re an expert or a novice, at Ditch Plains (an actual point break) you’ll be a regular Johnny Utah in no time. Rent a board and sign up for a lesson at the Air and Speed Surf Shop, a five-minute drive from the beach. If you’d rather hang fewer than 10, the extra long break of the waves makes body-surfing, boogie boarding, and paddle boarding livelier than in calmer waters. Be warned, though: The waves can get intense -- lifeguards are stationed here for a reason. Its remote location on the island makes this stretch of beach along the coves perfect for peace, quiet, and maybe a little zen. The three-hour drive here gets you to a main lot that needs a village permit. Instead, take the LIRR from Penn Station to the last stop on the Montauk line, a short cab ride from the beach, or reserve a spot on the Hampton Jitney. The beach, equipped with showers, is also right by the local Ditch Witch food truck, which has been serving up breakfast burritos, cinnamon buns, and its famous Ditch Witch Cubano to hungry surfers since 1994. When you’re done, take a short ride by car, cab, or bike (you can rent one at the Montauk Bike Shop for $50 a day) to check out the historic Montauk Lighthouse, commissioned by George Washington in 1792. The oldest lighthouse in New York State, it’s kind of a big deal. Shannon Carlin is a pop culture writer whose work has appeared on Bustle, Refinery29, and BUST. Her dream is to eat at Drake's restaurant, preferably with Drake.